Hatton joined Oregon State in 2012. He earned his B.S. in mechanical engineering from the Massachusetts Institute of Technology in 2005, followed by an M.S. in mechanical engineering from Carnegie Mellon University in 2007. He received his Ph.D. in mechanical engineering from Carnegie Mellon in 2011. Hatton was recently selected to receive a prestigious NSF CAREER Award for 2017. Hatton’s intent is to design robots that can learn such physically and mentally demanding tasks in an unstructured manufacturing environment. “To do this,” he explained, “we need to get inside the head of the person working the grinder and use that information to teach the robot ‘this is what I would do if I was to hold the grinder for hours.’” Workers, he emphasized, would remain involved but in a way that doesn’t jeopardize their health. Funding for the project comes from the manufacturer and from State of Oregon matching funds. Another project, funded by the NSF and done in conjunction with biologists at Berkeley, seeks to understand how spider webs allow their inhabitants to find food and learn about the world around them. Using a giant model of a spider web, Hatton’s team is applying its knowledge of engineered structures and vibrations to understand what’s happening inside the web. “Hundreds of vibrations pass through the web, which the spider feels through its feet,” he said. “We want to know how that happens.” Possible practical applications include determining how best to arrange motion sensors in buildings to monitor foot traffic and establish efficient emergency evacuation routes. Hatton also plans to incorporate the mechanics of spider and snake locomotion into robotics. Robot spiders and snakes, equipped with cameras, could be sent into collapsed buildings or other disaster sites, slithering or climbing over rubble piles to reach areas that humans can’t and transmit images back to rescuers. The robots might even be able to carry rescue tethers for hauling victims to safety. Finding definitive answers as to why things work the way they do is a constant motivator in Hatton’s research. He sometimes postulates theoretical underpinnings to applied work that colleagues are doing. “My education is in mechanical engineering, but I often function as more of an applied mathematician,” he said. “When given a set of observations from another researcher, I might come in to look for a structure that explains their underlying principles. That’s very satisfying.” He also delves into advanced mathematics for solutions to practical engineering problems in robotics and other engineering disciplines. “I’m trying to bring fire back down from the gods and apply it to something that, historically, has been a difficult engineering problem,” he said. His teaching, too, shades toward the mathematical side of engineering, both for undergraduate and graduate students, and he emphasizes the importance of considering problems in different ways. “I want students to see the process by which I approach a problem,” Hatton said, “and I want them to be able to adjust their thinking if the parameters of a problem shift.” Most gratifying of all is seeing his students hit ‘Aha!’ moments after they’ve solved a very difficult problem and realize they have the tools to move on to even more challenging and interesting work. Assistant Professor Geoffrey Hollinger conducts fundamental research in the quickly growing area of robotic systems. Among the major goals of his Robotic Decision Making Laboratory is formulating more effective ways for networks of autonomous robotic systems to work together to plan and coordinate their actions and learn how to make optimal decisions during complex data-gathering missions. Hollinger is particularly interested in robots that operate in the field under challenging conditions rather than in the controlled confines of a lab. He envisions a world where networks of highly mobile robots work with humans to provide real-time information about any physical location—on land, under water, and in the sky—that is difficult or impossible for humans to reach. “I’d like to see a big increase in the number of robots that are capable of working in harsh, unstructured field environments, such as the ocean, on farms, or flying through difficult, cluttered environments such as dense forests,” he said. Such networks of robot-borne sensors will be capable of making intelligent, independent decisions about where, when, and how far they travel and what information they collect and report. They will communicate and cooperate with other networked robots to learn from each other and adjust their plans in real time. In one of his current research projects, funded by the Office of Naval Research, Hollinger is working on adaptive decision making for naval systems used to collect information with cameras, sonar, and other types of sensors. His work aims to enhance the way robots make decisions to adjust to changing environments and enable them to optimize data collection to complete their missions more efficiently and effectively. In another research undertaking, sponsored by the W.M. 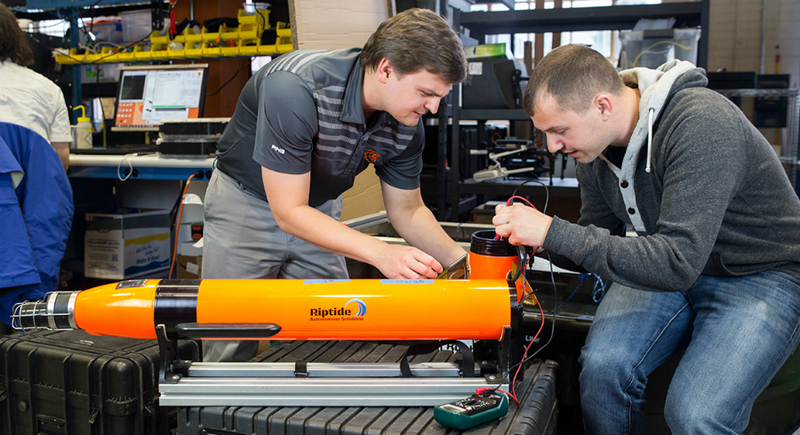 Keck Foundation and in collaboration with the OSU College of Earth, Ocean, and atmospheric Sciences (CEOAS), Hollinger and his colleagues are mounting bioacoustic sensors on ocean-going underwater gliders to detect fish, diving seabirds, marine mammals, and other ocean life. “I’m working on developing the motion planning and control to track and monitor biological hotspots in the ocean effectively,” he said. He’s also working with the company Near Earth Autonomy, Inc. to map tunnels and other enclosed spaces using unmanned aerial vehicles. The research is funded by the U.S. Air Force through the Small Business Innovation Research program. The idea, he explains, is to send a team of robotic aerial vehicles into a building or mine to create a comprehensive map of the enclosure. “They have limited communication with each other, and they need to coordinate their movements to build a map quickly while faced with constraints such as battery life and limited speed,” Hollinger explained. The application could help rescuers map collapsed mines during search and rescue operations or prove invaluable for urban search and rescue and military reconnaissance. Welty Faculty Fellow and Assistant Professor David Blunck’s research focuses on four domains: combustion, ignition, radiation, and energy. In his Combustion, Ignition, Radiation, and Energy Laboratory and Propulsion Laboratory, he and his team study practical energy conversion (such as jet engine combustion and propulsion) and natural energy conversion (such as forest fires). His research has applications in fields as diverse as aviation and wildfire management. Blunck hopes to establish a multidisciplinary fire center to contribute to fire management understanding and help communities prepare for and increase their resilience to wildfires. He also envisions Oregon State’s combustion research program becoming one of the strongest on the West Coast—for good reason, he believes, given the extraordinary level of expertise within his own lab and among his colleagues in the College of Engineering. Before joining Oregon State in 2013, Blunck earned his Ph.D. in Mechanical Engineering from Purdue University in 2010, then worked at the Turbine Engine Division of the Air Force Research Laboratory, where he was the lead investigator for fundamental combustion research related to gas turbine combustors and pollutant formation. He co-led a team of engineers in designing and testing the world’s smallest combustor for use in advanced gas turbine engines. He completed his B.S. in mechanical engineering at Brigham Young University in 2005 and his M.S. in mechanical Engineering at Purdue in 2008. In one of his current research projects — an international collaboration funded by the Federal Aviation Administration — Blunck is seeking to help streamline the costly and cumbersome process for screening alternative aviation fuels, such as biofuels or coal-based fuel. “Currently, the lengthy process costs millions of dollars and requires the manufacturer to produce large amounts of the new fuel, which then undergoes testing in airplanes on the ground,” said Blunck. Fuels that make the cut are then tested in flight — another costly step that still may not result in a viable fuel. But Blunck, using a relatively simple burner and small volumes of fuel, hopes to help determine more quickly and inexpensively which fuels to weed out early in the process and do not warrant full-scale testing. “By eliminating unsuitable fuels early on, the successful ones will become a reality sooner,” he said. In another study, funded by the Joint Fire Science Program and conducted in collaboration with the U.S. Forest Service, Blunck is investigating the rate of ember generation during forest fires. During large burns, embers can be lofted high into the air, travel miles on the wind and drop to earth to ignite new fires. “Our biggest concern is at wild/urban interfaces where civilization is surrounded by wilderness,” he said. “A rain of embers can threaten homes and other property, even if they’re miles from the main fire,” The work involves, in part, lab studies in which various forest materials are burned in a wind tunnel to quantify how pieces break off to generate embers, and how different parameters — moisture content, size, material, shape — change their behavior. The research will proceed to controlled burns and measurements of ember production rates in the wild. Such knowledge about the physics and chemistry of ember production could lead to predictive tools that enable incident commanders to dispatch resources more effectively to protect lives and property. In 2016, Blunck was awarded the prestigious Office of Naval Research Young Investigator Award for his research entitled “Ignition, Deflagration, and Detonation Behavior of Fuel and Oxidizer Mixed with Combustion Products.” He also was named the 2014-2015 AIAA Pacific Northwest Section Young Engineer of the Year. His groundbreaking research has attracted significant external funding from numerous sources, including the FAA, the Air Force Research Laboratory, the American Chemical Society, the Office of Naval Research, the National Energy and Technology Laboratory, and the Joint Fire Science Program.